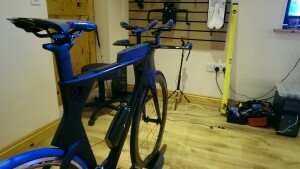 Today saw the opportunity to carry out a bike fit on the very best money can buy. The 2016 Scott Plasma. This truly is one of the very best TT bikes I have had the pleasure of working on in terms of spec, design, and most importantly, adjustment. At first glance it appears that the owner would suit Luke Skywalker rather than Alex Craven, the co-owner of local bike shop Velotive. With the ever present foiled tubes, bayonet front end, and aero feeding additions you would presume that adjustment would be an absolute nightmare. Previous fits with top end bikes such as the Cervelo P5 I encountered 5 hours of painful hacksaw carbon cutting, re-routing of internal cables, and shedding many a bead of sweat and anxiety to adjust the front end. With the Plasma, that is a thing of the past. Aero pad height, width, and reach are all easily accessible to achieve the perfect fit for any chosen discipline. 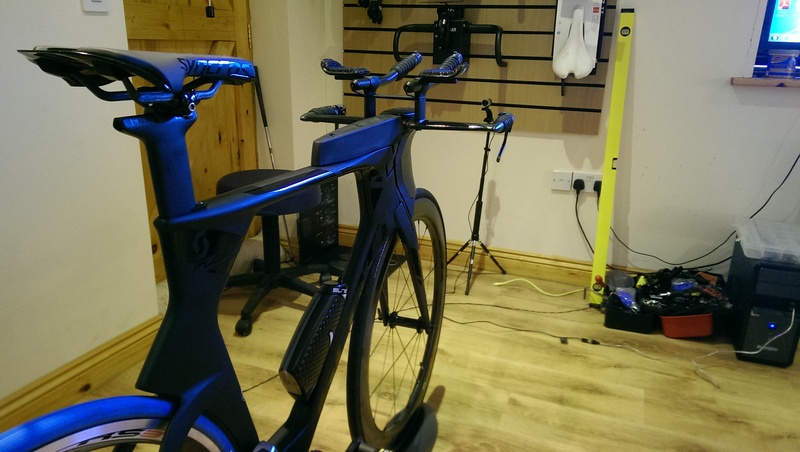 It just so happened that Alex will be competing in a full Ironman event this summer in Sweden so the fit had to accommodate 5hrs plus of riding and staying comfortable, whilst at the same time ensuring he was ready to run 26 miles afterwards. This was an easy achievement with the new Scott Plasma. I have been competing at National level road racing for 8 years now, and in that time I have learned what is a good bike shop, and what is good customer service. Sadly, the Internet doesn’t ensure the long term success of local bike shops as people are always scrupulously scouring the internet for the latest and best deal. That’s all being well but what happens when it goes wrong? For example, would you buy a £2000 TV online and hope the warranty covers any faults or things going wrong?  I know what i’d rather do, use a local service that sorts any problems quickly. And that’s where Velotive has the upper hand. I’ve been in many cycle shops in Cornwall over the years and believe Velotive is by far the best by a Kernow mile. Tony Hicks is one of the best bike mechanics in Cornwall, Dave McCann is one of the coolest looking hipster riders in Cornwall, and most importantly shop owners Jen and Alex Craven are having a really good go at developing a trustworthy bike service in Cornwall. Having known this pair for a few years now I have got to know them pretty well and can honestly say they are two of the most honest people I have met. If something’s not right or needs sorting, they’ll get right on it. So get down to Velotive and meet the guys and girls in the shop. You won’t be disappointed.